This unique mill, one of Dolcedo's oldest buildings, is located just a short walk from the village center. It enjoys a marvelous situation: romantic and quiet, next to the river Prino, with a bathing pond right in front of the door, but only a few steps away from all the amenities, such as shops, restaurants, bars, bus stop, etc. The former mill has been converted into a residential building and consists of two living units on three floors, which, however, could also be reconnected. It is therefore ideal for a large family, even with older children, or a multi-generation house, or also for two families! There are two separate apartments with several bedrooms, kitchen, bathroom and large terraces, as well as a plot of land on various levels leading down to the river. The house offers a living space of approx. 160 sqm, a basement of about 60 sqm and a utility room. Moreover, there are outdoor areas of about 120 sqm in total: two wonderful large terraces, a small balcony, a courtyard / garden, and a small plot by the river. A hallway next to the entry leads to the kitchen, a bedroom, the bathroom and a spacious living room with a small balcony and a large terrace of about 35 sqm. 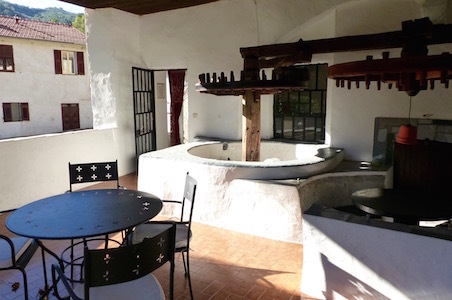 On the terrace and in the living room there are still original parts of the ancient mill system. Through a glazed floor panel on the terrace you can still see the old, iron mill wheel. 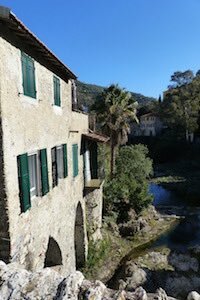 From the terrace there is a passage to the courtyard with small garden and to a romantic plot, which leads down to the river. The sunny terrace and the plot offer panoramic views of the surrounding village houses and the river landscape. From the garden you reach the vaulted cellars in the basement and the mill wheel. An external staircase leads to the apartment on the first and second floor, offering a kitchen, living room, bathroom and three bedrooms, as well as a spacious terrace of about 30 sqm, with an access from the living room. One bedroom has access to the terrace and another is located in the attic. The vaulted cellars in the basement can be reached from the ground floor apartment via an external staircase in the garden. There are different rooms, containing the old mill wheel and part of the former mill system, but also storage rooms. In addition, there is a utility room with its own external access, where the oil heating system for the whole house is located. Moreover, the living rooms are equipped with open fireplaces. The house owns a satellite dish, which actually receives German TV programs. The ancient mill was restored in the early 1970s and renovated over and over again in the following years, but in some areas may require renovation (bathrooms, kitchens ...). Recently, it has been used as a family holiday home, but was also seasonally rented to tourists. The historic mill is detached on four sides, except for one corner of the building. It enjoys a stunning location: right next to the river, but only a few steps away from the village center with its restaurants and shops. The romantic village of Dolcedo is situated some 7 km away from the sea and the lively coastal town Imperia. The Prino Valley invites to be explored on foot or bike along the many hiking routes meandering through beautiful woodland and olive groves. A number of bathing pools dotted along the river are perfect spots to enjoy a refreshing dip. The motorway connects conveniently with the International airport Nice in approx. 80 minutes.